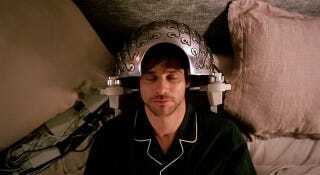 Get your Eternal Sunshine of the Spotless Mind references ready, because scientists have just figured out a way to erase bad memories using—you guessed it—electroshock therapy. Get ready for on-demand forgetting. It's a real thing now. The team later prompted patients to recall only one of the stories by replaying part of that slide show. Immediately afterwards, when the reactivated memory is thought to be vulnerable, the patients received electroconvulsive therapy. One day later, when given a multiple-choice memory test, patients were significantly worse at remembering details from the reactivated story, performing near chance. Patients' memory of the other story, however, remained largely unscathed. The test was conducted on 42 patients with severe depression, so there's a chance it could work differently on normal patients. It's also worth pointing out that ECT is no fun. It induces seizures and, well, doctors are shocking patients' brains with electricity. A breakthrough like this was due, though. For years, scientists have been saying we're on the cusp of developing a way to erase memories, and last year, they successfully erased the memories of sleeping mice. Then, just a few months ago, they managed to identify the gene that helps us forget. But a point-and-click method for erasing particular memories, that's proved elusive. Until now.